Janet H! Thank you Aurifil for your generosity and support! 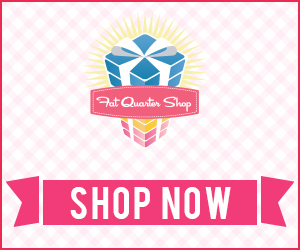 One lucky winner will be getting a fabulous Essentails II fat quarter bundle from the Fat Quarter Shop! “Quilting Gift Certificate” for $30.00 off the Quilting on a Baby size quilt or larger. (Baby, Lap, Twin. Full, Queen, or King) from Marcia’s Crafty Sewing & Quilting. Michele Foster of Mishka’s Playground is generously donating a free PDF ‘Cobblestone Mat – Table Runner’ pattern for one random winner each challenge! Thank you! And from Persimon Dreams … a Riley Blake Charm Back! northquilt!!!! Congrats to all our winners and a HUGE thank you to all of our sponsors this season! Just to give them a little extra … please feel free to stop by the sponsors facebook pages to give them your thanks as well! Love aurifil thread. Thank you to you, your wonderful helpers and these awesome sponsors.